The game of Lacrosse is physical. Rules have been established which are intended to protect safety of players and maintain control over the game. Each game must have a minimum of two officials; a referee and an umpire. There may also be a field judge and a chief bench official. Decisions regarding third and fourth officials are made by the organization hosting the game. It is the coach's responsibility to teach and instill in each player that they are expected to be physical, but not violent. They are required to play with mental and physical control. The NCAA has put forth a comprehensive series of regulations and penalties for infractions. Following is a brief summarization of some of the major and common rule violations. PERSONAL FOULS are infractions of a serious nature, which carry suspension from the game for periods ranging from a minute to three minutes, depending on the severity and intent of the infraction. The penalty's length is determined by the officials. Cross Check is a check by one player on another with the part of the stick between player's hands. Slashing occurs when a player swings his/her stick at an opponent in a deliberate, vicious, or reckless fashion, or when the stick comes in contact with an area of an opponent other than on their stick or gloves, unless opponent is actively attempting to deflect a legitimate check with part of their body. Slashing also occurs when the stick of a player strikes any part of an opposing player's body above the neck, unless when done by a player in an act of shooting, passing or scooping the ball. Illegal Body Checks occur when checking a player not within 5 yards of the ball, a late hit, contact from behind or above the shoulders or below the waist. This occurs when a body check is thrown on an opponent who does not possess the ball, or when an avoidable body check of the opponent is made after the opponent has made a shot or pass. Tripping is obstructing an opponent at or below the waist with any part of the stick or body. If a player makes a legitimate check with the stick to dislodge the ball from an opponent's stick and subsequently the opponent trips over his/her own or the checker's stick, this is not tripping. Unnecessary Roughness occurs when a player uses unnecessary and deliberate violent contact on an opposing player or is an infraction of the rules by being excessively violent when holding or pushing. Unsportsmanlike Conduct occurs when a person who represents a team attempts to argue with or influence the decision of a game official, using a threatening, profane, abusive, or obscene language or gestures during the game; or baits, taunts or acts in a manner considered unsportsmanlike by a game official. Illegal Crosse is the use of a Crosse which does not conform to NCAA rules and standards. Illegal Gloves are gloves which do not conform to required standards or when the glove's fingers and/or palms have been altered or removed. Technical fouls are less serious than personal fouls and are subject to a 30 second suspension from play of the offending player. Holding occurs when a player impedes or interferes with an opponent's stick movement. Off-Side occurs when there are more than six players on the opponent's side of the field. This also occurs when a defenseman crosses the center line as the ball is being cleared up the field and all three attackmen and middies have progressed past the center line. 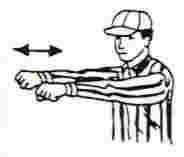 Warding Off occurs when a player with the ball uses his/her free hand or any part of his/her body to hold, push or control the stick or body of the player applying a check. Stalling is when a team intentionally holds the ball without advancing toward the goal. Screening occurs when an offensive player moves into or makes contact with a defender with the purpose of blocking the defensive player from opponent being played. Illegal Procedure is a term that includes touching of the ball by a player other than the goalie, playing in the game without a stick, use of illegal equipment, avoidable lateness of the team, placing a stick in an opponent's face, entering the game prior to expiration of a penalty, delay of game, more than 10 men on the field, and illegal playing out of bounds. (see complete description in NCAA rules). Interference occurs when one player interferes with the free movement of an opponent. Exceptions: when opponent has the ball and a player is within five feet of an opponent, or the ball is loose or on the fly, and both players are within five feet of the ball. Pushing is when a player pushes, thrusts, or shoves an opponent from behind. Pushing is permitted from the front and sides when an opponent has possession of the ball or is within five yards of a loose ball.